Pen-and-ink drawing of sculptures from the Halebid temple in Karnataka by an unknown artist between 1803 and 1808. 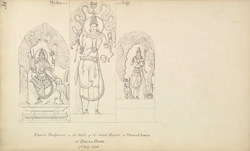 This image is from a collection of 156 drawings (185 folios) chiefly of architecture and sculpture in South India made between 1803 and 1808. The drawings are divided into roughly five groups; folios 52 to 68 are of sculpture at Halebid. Halebid, legendary for its wealth and splendour, was the capital city of the Hoysalan Dynasty who ruled an area in the south of India between the rivers Krishna and the Kaveri. As well as being great warriors they were also renowned patrons of the arts. The Hoysalesvara Temple was started in 1121 and took 80 years to complete. It is decorated with a profusion of gods, people, animals and plants with illustrations of parables, tales of war, hunting, music, dance and agriculture. The sculptors were encouraged to sign their works of art in order to further healthy competition and worked with Steatite, a rock which allowed them to achieve intricate detail as it is soft when quarried and hardens when exposed to the air.